Maybe your business has been building its own custom packet capture appliances, but you don’t have the resources to handle higher volumes and it’s too costly to hire more technicians. Or, you’re an OEM who wants to offer new appliances, but managing software configurations or hardware builds isn’t your strong suit. In either case, NextComputing can take on the overhead and complexity of integrating and delivering your turnkey product, including software installation, installing 3rd party devices like I/O boards, and testing – replicating your own procedures to deliver exactly as you would. 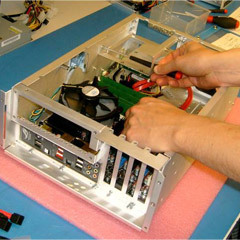 Outsourcing integration to NextComputing allows you to focus on innovating and selling your product. Contact us to speak one-on-one with a sales engineer about how NextComputing can help you grow your business.